Shut your pie hole, yes we all know the end of summer is looming. Sadness. My gauge is August 16, Elvis’ Death Day, from this day on it is downhill, just makes me think of peanut butter sandwiches and toilet mishaps and then having to change the rest of your life. The back-to-school commercials are on in full force, the new one from Staples, featuring our own East Ender, Stefan, is the best, click here to see it if you haven’t already. It’s not all about death, there is hope in the fall. In fact, all the best romances occur in autumn weather. I think when leaves start to fall, men go mental and question their own mortality and that’s when they start to go all *serious*, that or golf season is ending and they know they have to keep warm in the winter somehow. For some reason, this year, my stock is up, and I’m not going to ride wave all tee-hee and twirling my hair, I am a LOCA (lady of a certain age) so I’m going pro-active. I am going to learn how to bake the perfect pie. That’s how my mother and father met, she used to bake pies in the diner where he used to go when he was at the University of Manitoba. All fresh-faced and farm-fed, he ate her pie and then some more pie. And he is still eating her pie 60 years later because she makes the perfect crust! My personal favourite pie is blueberry and as it turns out, so is my son’s, Freddy’s. He ate the whole Farmer’s Market pie from Loblaws in between missions of Mario Galaxy. I had a sliver of it, pie goo: delish, crust: meh. 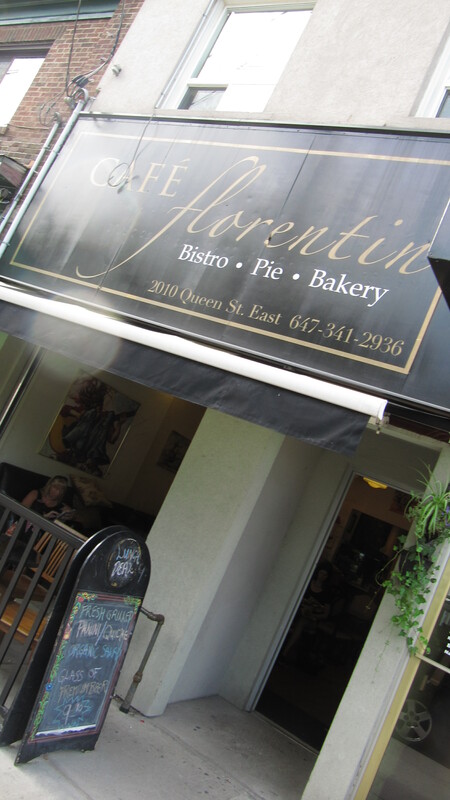 So a more upscale kind of pie I got was from Cafe Florentin at 2010 Queen Street East in the heart of the beach. Now this place has been around for four years or so, advertising the “best Espresso in the beach,’ totally the slogan that would go off my radar. The only coffee I drink is the black juice I brew first thing in the morning for medicinal purposes only so I can ensure that I will poop in my own toilet and not get caught spontaneously at some random spot where I will resist the urge and hold it in then freak out at a gas station 40 blocks out of my way. Privacy and an abundance of toilet paper is what it’s all about. If that’s TMI then tough bananas. Anyway, Cafe Florentin has pies at the beach location and a smaller shop in Leslieville, check out their website here. Not only are their pies fresh and gorgeous, I could have a coffee here, if I were on a date, say, and needed to act civilized. 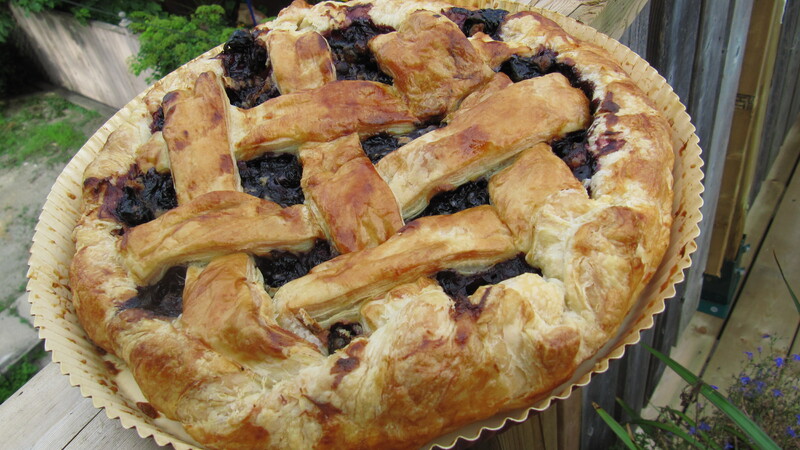 The crust is flakey and the blueberry filling is not too sweet because it doesn’t have to be…in a pinch, I will pretend to have made this pie myself and warm it in my own oven and serve it with a dollop of vanilla ice cream. And Labour Day won’t be so bad. Thanks for the Shout out Kristin! !